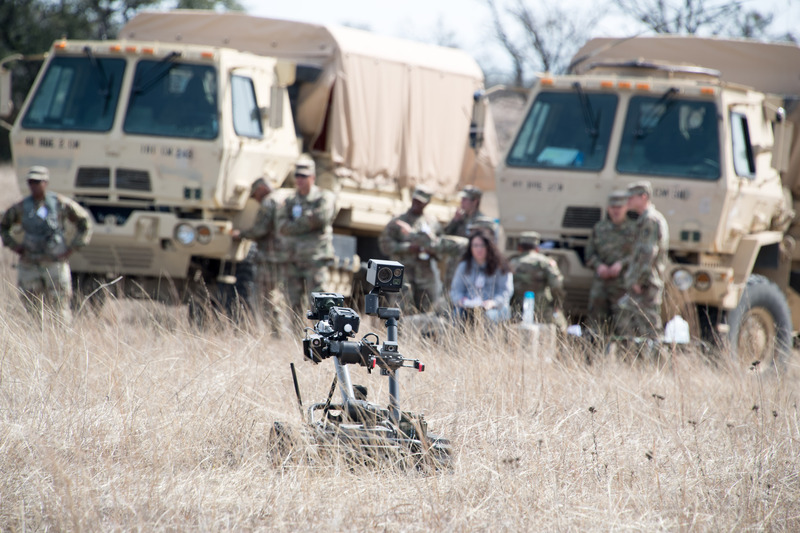 FORT HOOD, Texas – Chemical, engineer, and explosive ordinance disposal unit Soldiers here are joining a National Guard Civil Support Team to put the Army’s latest robotic system to the test. The Man Transportable Robotic System (MTRS) Increment II is designed to provide Soldiers with increased standoff capability to detect, confirm, identify, and dispose of hazards in a variety of missions and environments, according to Edward Jagodzinski, test officer with the U.S. Army Operational Test Command’s Maneuver Support and Sustainment Test Directorate (MS2TD). MTRS is a medium-sized robotic system with modular mission payloads capable of supporting Chemical, Biological, Radiological and Nuclear (CBRN) Soldiers, engineers, EOD, and Special Operations Forces. “The III Corps and 20th CBRNE Command has embraced this combined operational test venue with units from the 36th Engineer Brigade, 48th CBRN Brigade, and the 79th EOD Battalion located here at Fort Hood to ensure the MTRS can perform their unique mission on the battlefield,” said Jagodzinski. MS2TD designed each unit’s test mission to be operationally realistic using input from the units and from each branch’s training and doctrine proponent. He said by the end of these test events, the units will have employed the various systems under test in typical, tactical environments in both daylight and darkness, resulting in realistic training for the units and candid feedback for materiel developers. Soldiers from the 181st Chemical Company’s Hazard Assessment Platoon and the National Guard CST deployed the MTRS in urban, interior, and underground terrain in a variety of likely tactical scenarios over eight days. The goal is to evaluate the robot’s usefulness in performing their wartime and homeland defense missions, said Jagodzinski. The 48th CBRN’s Brigade Commander gave his opinion about the importance of supporting the test and the potential new capability for his Soldiers. “We want to ensure the right forces are provided for the right missions with the right capabilities to support this test mission, said Col. Christopher Hoffman. After the CBRN and CST complete their phase of testing, the engineers and EOD units will get their chance to put the MTRS to task. 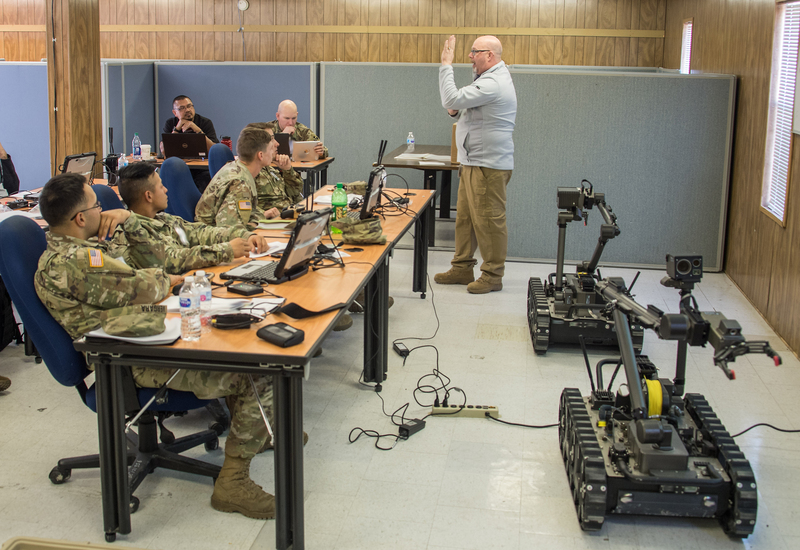 A route clearance platoon from the 20th Engineer Battalion’s 937th Engineer Company (Route Clearance) and EOD teams from the 797th Ordnance Company (EOD) will spend four days executing their core missions, using MTRS in place of their currently fielded TALON II robots. The Soldiers will use the MTRS to locate, identify, and neutralize a variety of simulated explosive hazards such as improvised explosive devices, mines, unexploded ordnance, and weapons caches in a wide variety of terrain and tactical situations. Test Soldier feedback — both positive and negative — gathered during the test will provide vital information to the capability developer and the Army Test and Evaluation Command, informing a future decision to field the system to the force. The Maneuver Test Directorate based at Fort Hood, Texas, conducts independent operational testing of infantry, armor, and robotic systems to inform acquisition and fielding decisions for the Army and select joint Warfighting systems. Poised, ready, and always able, the MTD has and will remain the “go to” test directorate to provide the Army Futures Command and senior U.S. Army Leadership with the truthful test feedback required to make informed decisions as to what capabilities will be brought to bear against future adversaries.